In municipal wastewater plants, the activated sludge treatment method requires the pumping of compressed air into aeration basins where a diffuser system ensures the air is distributed evenly for optimum treatment. 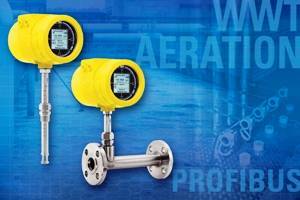 Flow meters are typically installed in the system piping to help monitor the air that is released into the basins. Precisely controlling the air flow is necessary to promote the growth of the micro-organisms that treat the wastewater and to reduce compressed air energy costs. The advanced ST100 Flow Meter is ideal for this task because of the meter’s accurate performance over a wide flow range, ease of installation, low maintenance requirements and digital bus communications versatility, including Profibus PA compatibility. Digital bus communications such as Profibus PA bus ensure flow meters and other process automation field devices are interoperable and compatible through an industry standard bus. The current version of Profibus PA includes many functions that simplify the handling of field devices, including the exchange of one field device for another device from a different manufacturer during routine plant upgrades. The ST100 Flow Meter with Profibus PA gives wastewater plant engineers excellent device flexibility while providing superior accuracy and reliability in harsh environments. Profibus PA communication facilitates plant system retrofits through a seamless integration process for new field devices including flow meters, which saves time and money. The ST100 meter’s insertion style configuration makes it a simple drop-in replacement where older technology meters were installed previously in wastewater plants. With the ST100 meter, engineers and technicians can easily manage multiple fluid flow process variables and configure the meter remotely from the safety of the control room. Whether the need is for Profibus, Fieldbus, HART, or Modbus, 4-20 mA analogue, frequency/pulse, or alarm relays, the ST100 Flow meter is the versatile communication solution. If a plant’s communication needs change, the ST100 meter adapts with a plug-in card replacement that can be changed out in the field. The ST100 can be calibrated to measure virtually any process gas, including wet gas, mixed gases and dirty gases. The basic insertion style air/gas meter features a thermal flow sensing element that measures flow from 0.07 NMPS to 305 NMPS with accuracy of ±0.75 percent of reading, ±0.5 percent of full scale. Designed for rugged industrial processes and plants, ST100 Flow Meters include service up to 454°C and are available with both integral and remote up to 300 meters electronics versions. The ST100 has the industry’s most comprehensive set of instrument approvals. The ST100 is approved for hazardous environments, including the entire instrument, the transmitter and the rugged, NEMA 4X/IP67 rated enclosure. Approvals include: SIL 1, ATEX, IECEx, FM, FMc, CPA, Inmetro, GOST-R and more.